Why Is BlackRock Closing 16 Of Its U.S.-Listed iShares Offerings? What’s Blackrock’s Financial Risk If Equity iShares Inflows Slow Down Going Forward? The global asset management industry faced sizable headwinds over the first quarter of the year. An increase in capital market volatility – from the unusually low levels seen over the second half of 2017 – was accompanied by a reduction in the value of debt and equity securities over Q1. While exchange-traded funds (ETF) also took a hit from this trend, the impact on total assets under management across ETFs was mitigated considerably by strong inflows into equity as well as fixed-income ETF offerings over the period. Notably, total assets under management for ETFs globally increased from $4.835 trillion at the end of 2017 to $4.918 trillion at the end of Q1 2018 due to positive exchange rate movements, even as the total asset base for all U.S.-listed ETFs shrunk from $3.445 trillion to $3.418 trillion over the same period. 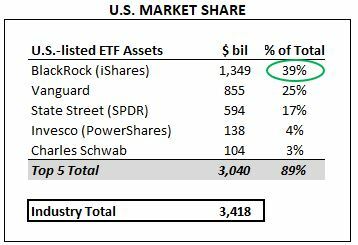 The five largest ETF providers in the U.S. (BlackRock, Vanguard, State Street, Invesco and Charles Schwab) command a market share of almost 90% – with the top 3 players having a combined market share of 82%. 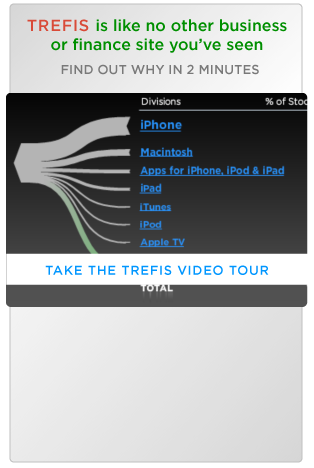 It should be noted that the top three players also account for more than 70% of all ETF assets globally. Details about the impact of changes in ETF assets on share price are available in our interactive dashboards for BlackRock and State Street. ETFs have seen impressive growth over the last decade, thanks to the convenience and transparency they provide investors, in addition to the relatively low fees. Over recent years, the intensifying competition among ETF providers has also triggered a price war among incumbents – making ETFs an even more attractive investment option for retail investors. Despite being the largest player in the industry since its nascent days, BlackRock’s iShares business continues to grow at impressive rates. The table below has been compiled from data gathered by ETF.com and captures the changes in U.S. ETF assets for the five largest ETF providers in the country over the last five quarters. As seen here, the total size of the U.S. ETF industry has swelled by roughly 22% over the last 12 months. The fact that BlackRock and Vanguard continue to grow at rates well above the industry average is noteworthy given the sheer size of their asset bases. Both asset managers have done well thanks to their extremely low-cost core ETF segment targeted at retail investors. Charles Schwab also stands out here as the only major ETF provider to buck the industry-wide decline in asset base over Q1 to post a 5% increase in total AUM. On the other hand, State Street’s ETFs lost 5% of their value over the quarter, primarily due to unusually high outflows from its single largest ETF offering – the SPDR S&P 500 ETF Trust (SPY) – in February as well as March. The fact that State Street continues to focus primarily on institutional investors, even as the retail investment segment grows at a faster rate, also hurt its asset base.